I'm running late...it's already after midnight, but this is my Tuesday post. Had agility class with Geena Bea tonight, and just like last week, we ran into an accident on the way home. Out in the country, 2 lane highway, and the exact same first responder stopping traffic. He came up to my car and started to tell me what was happening, and started laughing and said, "You again?" I mean, do you really expect to run into the same person on a deserted rural two-lane after 10pm on a weeknight? Small world. We still had about 15 miles to go before we would be home! Okay, so now you know why I am late. On to the card. I made a Christmas card tonight using the sketch at Sketch Saturday. 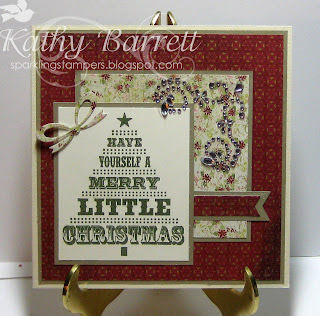 I used an MFT image, stamped with Versafine Olympia Green. I added a diecut bow (Impression Obsession) and fishtail (MFT). The flourish is from Michaels. I played around with Swarovskis, but couldn't get the look I wanted. The dp is old, old Memory Box. Do they even produce paper anymore? I used Canson gold specialy paper to mat everything. Thanks for stopping by. Time to dry my hair and head to bed! What a cheery card. Love the rhinestone swirls and your use of the sketch. Thanks for playing along with us at Sketch Saturday this week! OK so I'm really behind on my comments! LOL. THIS IS the card that reminds me of last year's Christmas card. It is gorgeous. I never know what to do with those christmas trees...even though I collect them...and you always know just how to make it stunning. LOve the green ink against all the gold and red. And the beaded flourish is beautiful. Such pretty papers! Love the stamp too!